It was a normal Monday night and we had a couple coming over after dinner. We had begun a relationship with this couple from Brazil two weeks earlier. We didn’t have a plan other than to share a dessert and learn more about our guests. Our first 30 minutes were spent trying to work through the language barriers between our family and this couple who primarily spoke Portuguese. One of them had been learning a lot of English recently but the communication barrier was still there. After finishing up dessert, I grabbed a copy of Sequence as an act of desperation to make sure our guests felt more connected in our home. Sequence isn’t language dependent, uses common playing cards and requires very little communication during the game play. This game changed the atmosphere of the night. We played on teams with our spouses then teamed up “guys vs. girls”. Our guests had a blast with the game and it broke down a language barrier that both couples definitely felt. Over the years our family has used board and card games as a way to bridge language and cultural barriers that can be tough to navigate. People communicate in so many ways and it’s not solely based on language. Picking a good abstract game is probably the easiest place to start with this list. Lots of abstract games can be easily taught by showing the rules without using many words. The game of Tsuro is a simple game of following paths and keeping your token from running off the board or colliding with another player. There is no text on the play tiles and simple lines make it a game that can be taught with minimal words. The game plays really well with any player count from 3 to 8. This is also a great choice for younger gamers or a mix of kids and adults. The modern game of Chess that we’re all familiar with has been around since 1200 AD. Chess is played in hundreds of countries but also has a pretty large learning curve to new players. 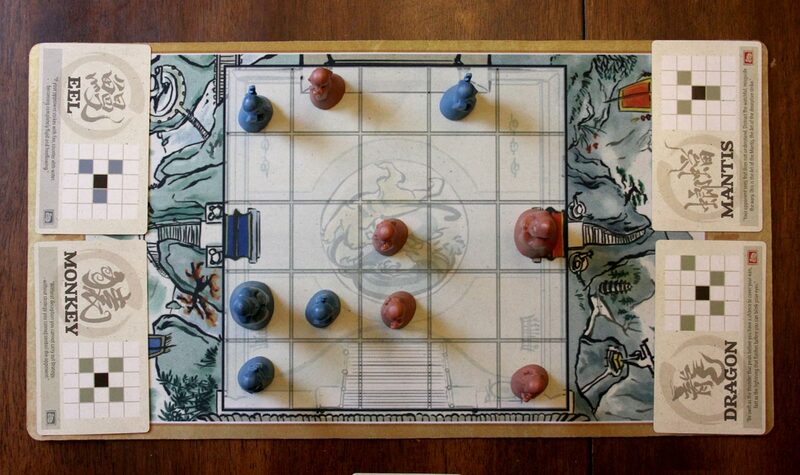 The games Onitama (review) and Santorini are two-player games that have a chess-like feel without all the baggage. In Onitama, players move a single piece using the visual cues on one of the two cards they have in front of them. No reading is needed and this game can be explained with minimal words. The goal is to capture the other players’ master pawn or get your own master pawn onto the opponents’ throne. Santorini is not only a beautiful game, but it only takes a couple minutes to learn. Players control two builders each on the board. On your turn, you must move one builder and build a structure with that same builder. That’s it! Santorini is like a tug of war, battling to get one of your builders to the top of a 3-tier structure. The rule book uses great diagrams and make it simple to explain with limited words. The game of Qwirkle is totally dependent on colors and shapes. The game is quick to learn and is not dependent on language. The biggest hurdle would be sharing how scoring works, but this could be handled by pictures in the rulebook or a simple drawing on paper. Qwirkle is a great option for up to 4 players that don’t share a common language. If you’re looking for another game that relies heavily on colors, you should check out Lanterns: The Harvest Festival (review). Matching colors and adding to the grid to score points could be taught with minimal words. If you’re looking for a card game that requires quick color and pattern recognition, a co-worker of mine recommends a game called Set. This one has been around since the mid-70’s and players use speed to complete sets of like colors, shading, symbols, numbers or a set of completely different cards. Sometimes you need an interactive game that will get people laughing and that’s when dexterity games enter the picture. We’ve taught lots of kids and adults the game Dr. Eureka (review). Players are trying to solve a simple puzzle using test tubes and colored marbles. Players cannot drop or touch these marbles and only the fastest player will win the point for that puzzle. Players with quick hands will love games like Spot It and Jungle Speed (review). Similar to Dr. Eureka, these games rely solely on images and are great for a wide variety of ages. These are filler games that will get everyone involved in the game. The game of Junk Art has players build structures out of a variety of wooden objects that don’t always go together. This is another game that relies on cards with printed images and doesn’t require text. With almost a dozen game types in the box, Junk Art gives you a good variety of options for playing over and over. Dice have been a part of gaming since 3000 BC. These dotted cubes have made an appearance in hundreds of countries and is a simple way to break down a language barrier. The game Roll for It requires players to allocate dice after rolling in order to win cards that have assigned point values. The game of Farkle has players rolling dice to accumulate points without busting. 1’s and 5’s score points along with sets of 3 matching dice and different dice configurations such as straights and three sets of pairs. This game is easily taught with minimal words and a simple chart of how much each dice configuration scores is printed in the rules. If you’re looking for a more intense dice game, try bringing Fuse to the table. Players are working cooperatively to defuse bomb cards that rely on color and number combinations. Since it’s a co-op game, trying to communicate with your teammates would be a little tricky but not impossible. This game is simple enough to modify by taking out a couple cards or increasing the time limit. These games are only scratching the surface of the hundreds of great games that are “language independent”. Sequence has been one of our go-to games in the past, but we want to know what games have worked for you. Share your suggestions in the comments below. This will help others to find great games that can bridge the language barrier.